M2Crypto is a python wrapper for Secure Socket Layer (SSL) Protocol. M2Crypto is used by python developers for configuring the secure communication between client and server. M2Crypto is well formatted wrapper and uses all SSL related protocols/algorithms such as SA, DSA, DH, HMACs, message digests, symmetric ciphers etc. M2crypto was developed by Ng Pheng Siong, it is a powerful Python library. In this article, we will be reviewing its installation process on Ubuntu Linux. In order to install M2crypto on your ubuntu , first make sure that your have Python development packages installed on your ubuntu, if they are not already installed, launch your terminal and run following command to intall them. This shouldn’t take more than a min, as soon as dev package installation is complete, we can go ahead with m2crypto installation. Run following command on your terminal to install m2crypto. 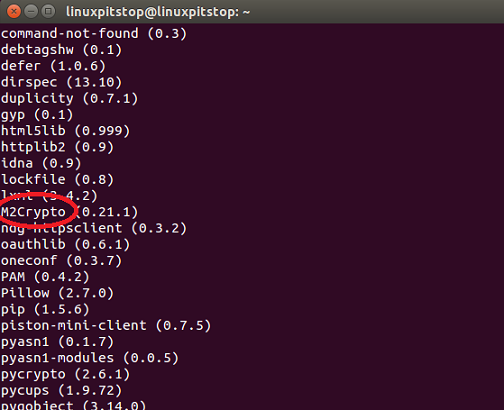 Please note that m2crypto is a part of official ubuntu repositories, all you need to do is to run its install command using Ubuntu Package Manager, APT. Once the installation is finished, you can use python’s pip utility to see if the module is successfully installed or not. Run following command and you should be able to see m2crypto listed there. If pip is not installed, simply run following command to install it. Unfortunately M2Crypto development seems to be paused at the moment, not much updates on reported bugs and some experts are afraid it might push this useful tiny tool down the drain in coming future.